Are you tired of losing your stuff? 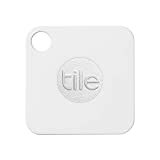 We don’t typically recommend Tile because there are tons of great Bluetooth trackers out there and Tile is so expensive. That said, when Tile trackers go on sale it’s a completely different story. The $20 Tile Mate “Anything Finder” is on Amazon right now for just $9.99, which is a killer price for this popular tracking tag. There’s no telling how long this sale will last though, so grab a few quickly before the price goes back up.